We’re not even joking. If you look up the word “commitment” in the dictionary, there is a picture of this little girl. When four-year-old Sophia took centre stage during a preschool graduation performance of a Disney favourite, she was surrounded by other excited little kids and did not particularly stand out from the pack. Things changed very quickly. While it’s hard to know which way these concerts will go, Sophia appeared determined to not only give things her all, but to turn preconceptions about boring school events upside down – and make her presence known. 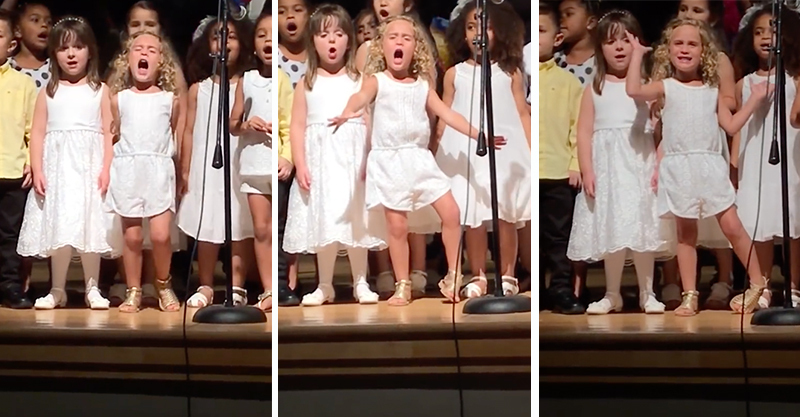 “4 year old Sophia slays her graduation performance. The children were supposed to perform a mellow rendition of Moana’s How Far I’ll Go … she clearly missed the memo!” the caption posted alongside this compelling video of Sophia’s class concert reads. Sophia brought her own pizzazz to the stage, perhaps hoping to inspire the children around her to turn on something special for the assembled parents. This little girl was not going to tolerate any of the usual nodding off or fanning self with program we often see from mums and dads at such events. Instead, she presented in sparkly sandals and fashion-forward romper, ready to slay the audience and capture their attention, at least for this one song. It totally worked! Not only did she mime the Moana soundtrack tune How Far I’ll Go pretty faultlessly, she combined it with the kind of dramatic delivery one would normally see on Broadway. From Liza Minelli. Bette Midler, even. The audience could not have loved it more. While those watching were transfixed by Sophia’s emotive arm gestures, expressive face and passionate leg wiggles, the children performing alongside her were perhaps a little challenged by what they saw. It seems they were not ready for Sophia’s next-level theatrics, content to stay in their own comfort zone of swaying, opening and closing their mouths quietly and looking for their granny in the audience. More fool them. It’s fair to say that Sophia belongs on the stage. She remained unfazed by the bright lights, her underperforming co-stars, parent paparazzi and the questionable audio quality. Instead, she seized the moment, felt the music, dived right in and made this song her own. We’ll take two tickets in the front row, please! Do you have a little stage star at your place?